George Mortimer Pullman was born on March 3, 1831, the third child (and third son) of James Lewis Pullman (known as Lewis) and Emily Caroline Pullman (nee Minton) in Brockton, New York in Chautauqua County. Brockton is 54 miles southwest of Buffalo. George’s father, Lewis, turned from farming to the more lucrative trade of carpentry. Brockton was also the location of a general store owned by Emily’s uncle, John H. Minton, and Edwin Buck. George quit school after the 4th grade and went to work for the Minton and Buck general store for $40.00 a month in 1845. In 1845, his parents moved to Albion, New York, east of Buffalo, to work as a carpenter on the Erie Canal. George had 9 brothers and sisters, many of whom died in infancy: Royal Henry (1826-1900), Albert Benton (1828-? ), Frances Carolan (1833-1834), James Minton (1835-1903), William Eaton (1837-1839), Charles Lewis (1841), Helen Augusta (1843), Frank (n.d.) and Emma (n.d.). Lewis was raised a Baptist and Emily a Presbyterian, but both turned to the “God is love” message of the Universalist evangelist minister Timothy C. Eaton. Lewis was very active in the church, leading services at the nearby Portland church known as the First Universalist Society when no preacher was available. Two of George’s brothers, Royal Henry Pullman and James Minton Pullman became prominent Universalist ministers. Lewis worked as a carpenter in Albion, but also became an entrepreneur moving buildings out of the way of the canal as it was dug. His method, using screwjacks and a machine he invented, was patented by him in 1841. In 1848, George quit his job in Brockton to join his family; soon afterwards, Henry and Albert also came to Albion to start a cabinetmaking business. In 1853, Lewis died, and George took over his business at the age of 22. In 1854, George contracted with New York state to move about 20 buildings (mostly warehouses) away from the canal so it could be widened. George realized that sooner or later the contract with New York state would run out. 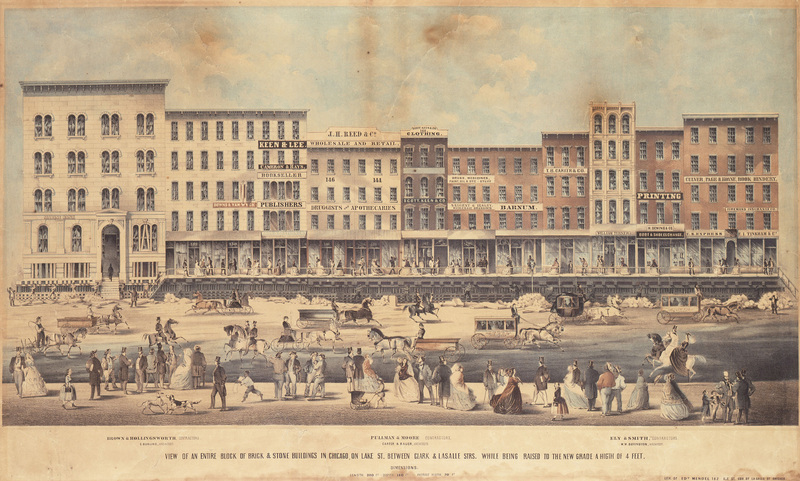 In addition, the United States was in the middle of a recession with a corresponding slowdown in business, so, in 1857, he answered an advertisement to help raise Chicago buildings to help control flooding and to enable a modern sewer system to be installed. Chicago was a victim of its own success, being thrown up in record time on land that had previously been marsh. Many of the city’s blocks were at or near the water table. The entire city, in fact, had to be raised an average of six feet. Entire city blocks were raised on massive timbers and screwjacks. Most of the buildings and blocks were raised by the firm of Brown and Hollingsworth, principals of the firm being Bostonian James Brown and Chicago engineer James Hollingsworth. Pullman joined forces with a man named Moore to handle the workload. Lifting blocks called for massive cooperation, and in several instances, all of the competing firms joined together to contract out the process. Hollingsworth and Brown joined Pullman and Moore and Ely and Smith to raise the block of Lake Street between Clark and La Salle for a combined cost of $17,000. Pullman was always an inventive, innovative entrepreneur. Legendarily, an extremely uncomfortable overnight train ride from Buffalo to Westfield, New York, caused him to realize that there was a vast market potential for comfortable, clean, efficient passenger service. He had a great deal of experience with compact and efficient sleeping accommodations thanks to his experiences with canal boats on the Erie Canal. He formed a partnership with former New York state senator Benjamin C. Field in 1857, one of his close friends and neighbors from Albion, to build and operate several sleeping cars. Pullman and Field secured a contract from the Chicago, Alton and St. Louis Railroad to develop a more comfortable sleeping car. Pullman and Field converted two moderately successful cars. Field, more interested in politics than rail cars, assigned his interest to Pullman in exchange for future loans. 1859 saw the Pike’s Peak Gold Rush. Pullman caught gold fever and sought to build his fortune in Colorado, driven by his desire to finance his nascent passenger car service. Pullman realized that the real money in a gold rush is made by supplying other fortune hunters, so, true to his mercantile roots, he established the firm of Lyon, Pullman and Company with James E. Lyon. The company operated as a freight business and ore crushing mill. As soon as practically possible, Pullman dissolved his partnership with Lyon, whom he disliked. Spafford C. Field, brother of Pullman’s rail partner Benjamin C. Field, traded 5 yokes of oxen and a wagon, worth $400.00, to James Snow for his property in Central City, Colorado. Through other purchases, Lyon, Pullman and Co. eventually had about 1,600 acres surrounding the Snow property, which they platted as Cold Spring Ranch. The Ranch became a prominent base camp for the gold fields, where miners could bed down, camp, purchase supplies, and buy a meal and a drink. It became known as Pullman’s Switch, where weary teams of animals could be switched for fresh teams before attempting to take on the rigors of the mountain passes. Pullman returned to Chicago in April, 1863. 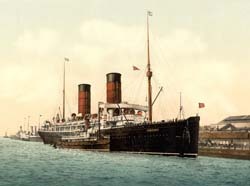 Pullman built the Springfield, named after the town it was built and Lincoln’s home town, and the Pioneer. The cars were costly, comfortable, clean, and beautiful; the Pioneer alone cost $18,000 to build. In 1864, Pullman was also called to the draft, but like many young men with means, he hired a substitute to take his place in the Union Army. After President Abraham Lincoln was assassinated in April, 1865, his body was transported by the so-called “Lonesome Train” to Springfield for burial. 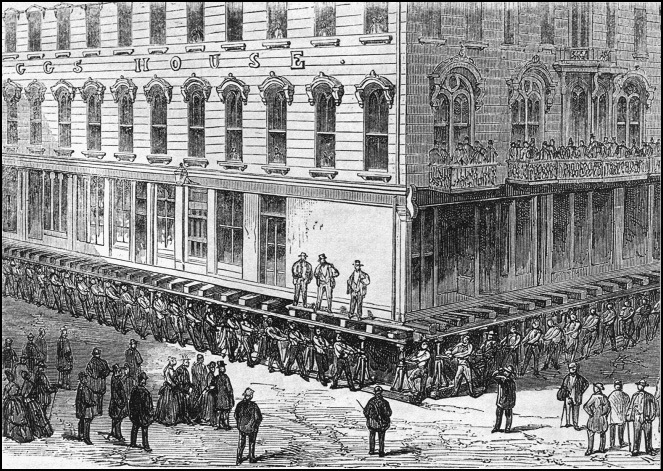 From Washington, the funeral train bearing his body started west by slow stages. Across the country, mourners lined the tracks. By the time the cortege reached Chicago, Mrs. Lincoln collapsed. When arrangements had to be made for her return directly to Springfield, Pullman made his new Pioneer sleeper available. Pullman, a genius for public relations and a shrewd and intrepid businessman, so intrigued Andrew Carnegie that he became Pullman’s largest investor. With his own fortune and that of his investors, Pullman greatly expanded the company. He created his first hotel on wheels, the President, a sleeper with an attached kitchen and dining car. The food rivaled the best restaurants of the day and the service was impeccable. A year later in 1868, he launched the Delmonico, the world’s first sleeping car devoted to fine cuisine. Both the President and the Demonico and subsequent Pullman sleeping cars offered first-rate service which was provided by recently-freed former house slaves who served as porters, waiters, chambermaids, entertainers, and valets all rolled into one person. In January, Benjamin Field dissolved the partnership and the company became known as the Pullman Palace Car Company. The company charter was approved by the Illinois Legislature on February 22, 1867. The board of directors of the company elected Pullman as president and general manager. Pullman mostly handled marketing sleeping car services, while his brother Albert managed the manufacturing end of the operation. Lawyer Charles Angell, who later embezzled thousands of dollars from the company, handled the company’s financial and legal affairs. In 1869, Pullman bought the Detroit Car and Manufacturing Company to consolidate all of his manufacturing operations into one facility. He built 5 classes of cars: hotel cars, parlor cars, reclining room cars, sleepers, and diners. Pullman also aggressively pursued his competitors, buying out the Central Transportation Company, his main competitor, in 1870. By 1875, the company had built a successful business model, of leasing Pullman cars to railroads and providing complete service for the traveling public. Pullman moved his family from Albion to Chicago in 1865. He married Harriett Sanger, daughter of a construction company owner, on June 13, 1867. Together, they had four children: Florence (1868-1937), Harriett (1869-1956), and the twins George, Jr. (1875-1901) and Walter Sanger [known as Sanger] (1875-1905). A young man named Gustave Behring claimed that he was the illegitimate son of Pullman. Florence was his acknowledged favorite, accompanying him on many business trips. Harriett lived the longest, until 87, and had several marriages. Of the twins, not much can be said. George in particular led a life that could charitably be described as spirited, being named in several romantic scandals and at least one divorce proceeding. George Pullman’s will clearly reflects his feelings towards his children: his wife and his daughters got the vast majority of the estate, while his sons were left with little. When he was frequently out of town, he traveled in a luxurious private car outfitted for him at a cost of $38,000. In 1888, Pullman built a home, Castle Rest, on Pullman Island in Alexandria Bay in the Thousand Islands between New York and Ontario. He also maintained a home in Albion, New York; and one in Long Branch, New Jersey. Pullman’s mother Emily particularly liked the resort, and the entire family gathered there in August of every year for her birthday. The castle, the first of several castle-like structures in the area, was designed and built by Pullman’s architect, Solon Spencer Beman. At Pullman's other favorite estate, Castle Rest, in Elberon, NJ. Probably July, 1894, celebrating his mother's birthday and taking refuge from the 1894 strike. When business fell off in 1894, Pullman cut jobs, wages and working hours, but not rents or prices in his town. His failure to lower rents, utility charges and products led his workers to launch the Pullman Strike, a violent upheaval which was eventually broken up by federal troops sent in over the objections of Illinois Governor John P. Altgeld, by President Grover Cleveland. A national commission formed to study causes of the 1894 strike found Pullman’s paternalism partly to blame and Pullman’s company town to be “un-American.” In 1898, Illinois Supreme Court forced the Pullman Company to divest ownership in the town, which was then annexed to Chicago. Pullman died of a heart attack on October 19, 1897 at the age of 66. Funeral services were held privately at his mansion on Prairie Avenue in the afternoon. The funeral cortege arrived at Graceland Cemetery where elaborate preparations had made. A pit the size of an average room had been dug on the family plot, its base and walls of reinforced concrete 18 inches thick. Into this the lead-lined mahogany casket was lowered, and covered with tarpaper and asphalt. The pit was filled with concrete on top of which a series of steel rails were laid at right angles to each other and bolted together. These rails were embedded in another layer of concrete. It took two days to complete, then sod was put down. These precautions were taken to prevent any desecration of the body — an unfortunate price Pullman paid for his victory in the Pullman strike Ambrose Bierce said It is clear the family in their bereavement was making sure the sonofabitch wasn’t going to get up and come back.